Baptism is the basis of the whole of our Christianity, the gateway to life in the Spirit, and the door which gives access to the other sacraments. By baptism, we are set free from sin and reborn as children of God. We become members of Christ’s body, the Church, and are given a share in her mission. Baptisms are celebrated on Sundays, the day each week when we celebrate Christ’s resurrection: his victory over sin and death. The priest or deacon welcomes the one to be baptised with great joy in the name of the parish community. Parents and godparents commit themselves to ensuring the child will be brought up to follow God’s commandments as taught by Jesus Christ. The saints in heaven are called upon to pray for the child, who is then baptised in the name of the Father and of the Son and of the Holy Spirit. 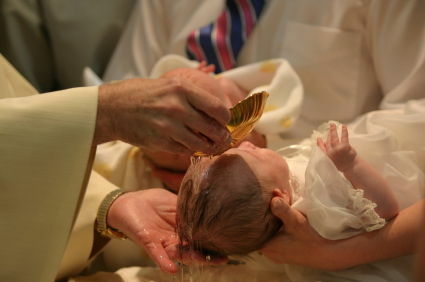 If you would like to have your child baptised, or seek baptism for yourself, please contact us for more information.